Every winter, if the snow gods allow, each group at Miquon makes snow taffy during one of their science classes. 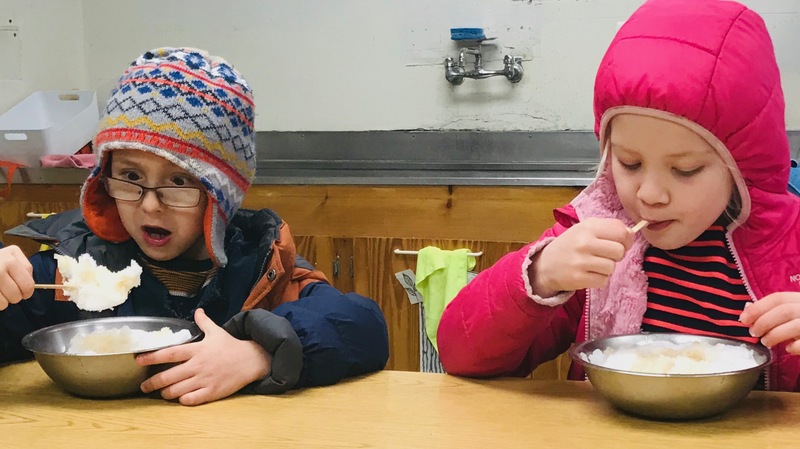 Making snow taffy is an annual tradition and provides opportunities to introduce or reinforce science skills and concepts: using thermometers, learning about evaporation and concentration, and experiencing the magic and chemistry of cooking. It’s also a fabulous way to enjoy each other’s company. Many children have asked for the recipe to cook snow taffy at home. What follows is a guide but experience is the best teacher. Heat the maple syrup in the pan over high heat until it begins to boil. Turn the heat down to medium and continue stirring as the water evaporates. Cook the syrup for 3-5 min. Begin testing the syrup: to test, take a small amount (¼ tsp) of the syrup from the pan and drizzle it on the snow. Let it cool for 15 seconds and then look and touch. You want taffy that makes a light indentation and lays on the snow. It should feel gummy when you pinch it. If it soaks right through and quickly melts the snow, it is still too diluted to make taffy. If it lays on the snow and feels hard, it is too concentrated and will become a hard candy. When the test drizzle is the right concentration, pour a tablespoon or so over one of the small bowls and let it cool for 15 seconds. You may then pick it up with your hands or swirl it around with a popsicle stick or spoon to enjoy as a taffy pop! Note: In candy making, temperature is a key factor in what type of confection you would like to create. I’ve found that the ability to maintain proper temperature can vary widely with electric and gas stoves, so testing for concentration is more effective when making snow taffy. Have fun experimenting!